This section contains the last news related to the INSIGHT project, and the list of events and meetings with the participation of the project partners. Insight and intuition might be the most mysterious and fascinating fields of human thinking and problem-solving. They are different from standard and analytical problem-solving accounts and provide the basis for creative and innovative thinking. Until now they were investigated in separate academic fields with differing tradition. Therefore, this eBook attempts to bridge the gap between both processes and to provide a more integrated perspective. Several experts address the underlying cognitive processes and provide a broad spectrum of new empirical, theoretical, and methodological insights. On March 15th 2017 Prof. Szathmáry of the PARMENIDES Foundation, Scientific Coordinator of the INSIGHT project, has been awarded with the Széchenyi Prize by the Hungary's President of the Republic János Áder. This price is a recognition of Szathmáry outstanding work in evolutionary biology. Another evidence that the EU is supporting the excellence in science. 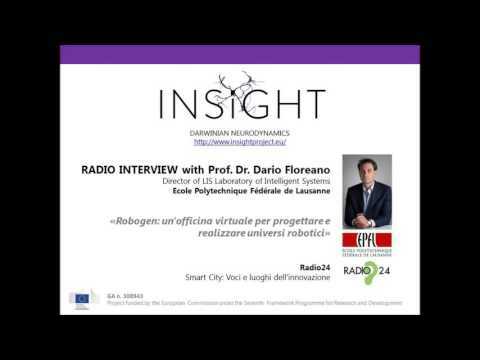 Prof. Dr. Dario Floreano, Director of the Laboratory of Intelligent Systems (LIS) at the École Polytechnique Fédérale de Lausanne (EPFL), talks about Robogen in this interview at the Italian radio channel Radio 24. Researchers from the INSIGHT project and external experts from EVOEVO and other projects, meet at PARMENIDES FOUNDATION in occasion of a thematic workshop. The group of Prof. Dario Floreano at EPFL, launched a new website on Robogen: ROBOT GENERATION THROUGH ARTIFICIAL EVOLUTION. Luc Steels is the curator of the exhibition "Arte@IJCAI. Inteligencia artificial" organized jointly with the IJCAI, the International Joint Conference on Artificial Intelligence, the main international gathering of researchers in AI. The aim of the exhibition was to create a bridge between the conference and the citizens of Buenos Aires. The INSIGHT project will participate at the IJCAI Conference, the most important world-wide conference in Artificial Intelligence which will take place in Buenos Aires this summer. During the event, that attracts thousands of researchers and technologists from all over the world, the project's results will be presented by the INSIGHT key researchers. The XXVI month project meeting will be held in Lausanne, Switzerland the next 27th and 28th April 2015. The European Commission officially accepted the consortium's request of extending the project duraton of further six months, in order to complete the activities to be perfomed in the frame of the project, and to ensure the achievement of the results expected. The project is providing encouraging results, therefore the extension will be a good change to ensure the project's success. WORKSHOP "THE NATURE of INSIGHT - PART II"
The PARMENIDES FOUNDATION organized a workshop to provide new neuro-cognitive models and experimental paradigms that help us to better understand the foundations of insight problem solving, and share ideas that foster our further projects. The XXI Month Meeting will be held in Udine (Italy) the next 5th and 6th November 2014. From the 18th to the 22nd August an INSIGHT Workshop was organised in Brighton. Master Level Course in Lausanne, Switzerland from February to May 2014. The AISB 2014 Convention at Goldsmiths, University of London (hereafter AISB-50) will commemorate both 50 years since the founding of the Society for the Study of Artificial Intelligence and the Simulation of Behaviour (the AISB) and sixty years since the death of Alan Turing, founding father of both Computer Science and Artificial Intelligence. The convention will be held at Goldsmiths, University of London, UK from the 1st to the 4th April 2014, and will follow the same overall structure as previous conventions. This will include a set of co-located symposia hosting events that include talks, posters, panels, discussions, demonstrations, and outreach sessions. A fully funded PhD is available to work as a part of our group studying Darwinian Neurodynamics, a new theory of the brain that explores how Darwinian principles may be integrated with supervised and unsupervised learning. The candidate will develop cognitive architectures capable of accumulation of adaptation, transfer learning, and creativity in robot control. Robots will learn a series of tasks. The skills acquired in earlier tasks will be reusable in later tasks, thus allowing incremental learning. The critical research question is what kinds of cognitive architecture are most suitable for transfer learning in reinforcement learning problems? Knowledge of machine learning, evolutionary computation, and reinforcement learning is highly desirable, but an interest and enthusiasm for developing complete models of cognition is key. Experience in computer vision, computational neuroscience, and cognitive science is also desirable. You'll be working alongside an EU group that includes Prof. Eors Szathmary (Munich), Prof. Dario Floreano (EPFL), Prof. Luc Steels (Barcelona) on the FP-7 Funded Project INSIGHT, and a John Templeton Foundation funded project "Bayes, Darwin and Hebb". This will additionally fund visits to partners in Europe where you will present your work. You will be expected to also work as part of robozoo.co.uk to test your cognitive architectures in a range of 3D printed robots, the Nao Humanoid robot, and other robotic systems for sale to the general public. The PhD is funded from either EPSRC (3.5 years UK Residents only) or an International studentship (3 years). To apply, please follow the on-line process (see the apply button below) by selecting “Computer Science” in the “A-Z list of research opportunities” and following the instructions on the right hand side of the web page. Chrisantha Fernando (c.t.fernando@qmul.ac.uk) to arrange an informal discussion and to obtain our research papers in Darwinian neurodynamics prior to your application. The next project meeting will be held in Barcelona, in October 2013. The hosting partner is the University Pompeu Fabra. The agenda and the logistic guidelines will be available soon in this page. The Queen Mary University London hosted the 2013 UK Nao London Hackathon, during which developers from all around the world met and spent time together during two days of Nao development. To see some photos of the breakout session videos go to the link below. More photos can be found at Robert Triest's great site www.naornever.com. A documentary for TV broadcast on the first year of INSIGHT project is under production. The director is Dir. ROLLO HOLLINS. Prize: £500 provided by the "European FP-7 INSIGHT Project on Darwinian Neurodynamics in Humans and Robots"
Question: If Nao can decide, how should it decide what is interesting to do such that it keeps producing novel but non-trivial new behaviours? •Maximise compressibility of its models of the world? •Maximize the variance in quality of solutions? •The work must lead to a journal publication with Dr Chrisantha Fernando (QMUL). •The work must be the original work of the entrants. •Entrants must attend the hackathon and work on the behaviour at the hackathon. •Dr. Fernando decides whether any behaviour sufficiently addresses the question. •The winner (if any) co-operates with Dr. Fernando when writing the paper. •The prize will be awarded on publication of the paper. Entering this competition does not exclude people from winning any other prizes at the hackathon. For further information please contact Dr. Fernando directly via email ( ctf20@eecs.qmul.ac.uk) or skype (chrisantha-f). This work is supported by the "European FP-7 INSIGHT Project on Darwinian Neurodynamics in Humans and Robots"